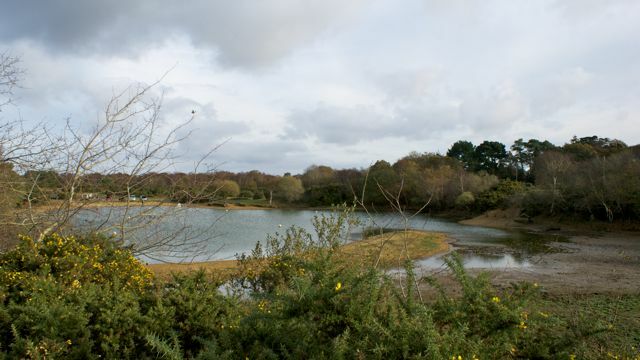 Setley Pond occupies the southernmost extension (dating from World War 2) of a gravel pit founded in Victorian times or earlier which covered the area of the present day car parks and land northwards towards the road. The part of the pond which is used for model boating extends from the car park southwards to the “island”, a distance of about 100m. 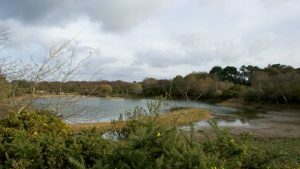 The shallower water beyond the island is a haven for the New Forest animals and birds including the pond’s herons. It extends a further 50m if the pond is “full” but dries out when the water level is low. The top photo is a view looking northwards towards the car park following a dry summer (2011) when most of the region south of the island had dried out. In January 2016 the pond was full but not overflowing. Click on the photo to view a short video showing an aerial view of Setley Pond and the surrounding countryside at that time. 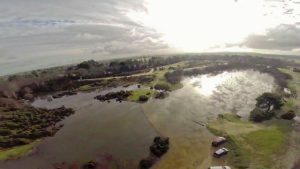 In contrast, during January 2014 the pond had flooded across the car park and over much of the area of the old gravel pit; again click on the image for a video showing the pond in flood! 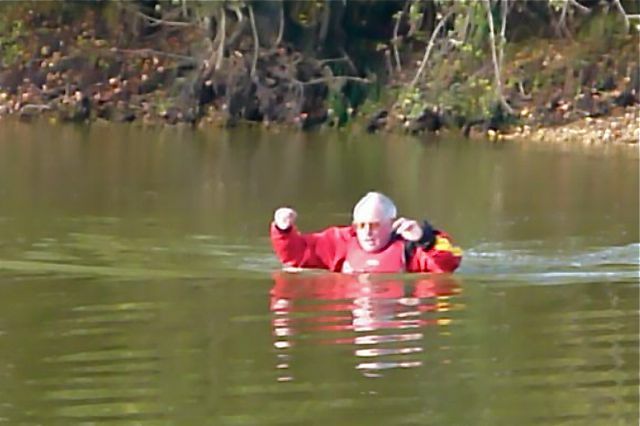 Wading in a deeper part of the pond following a very dry summer during a depth survey. 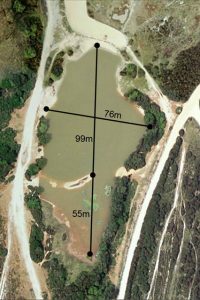 Aerial view of the pond with dimensions indicated. 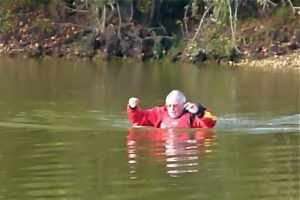 The depth of the pond varies between about 1m to 2m or more depending on how full the pond is. Most of the bottom of the pond is level and covered by about 30cm of mud, however there is a deeper region south of the planks on the western bank and there may be deeper holes concealed by the water and mud.